The majority of the literature on scorpionism and medical important scorpions is focused on species on the family Buthidae. But many of the species in the family Hemiscorpiidae can also cause death or serious morbidity. Interestingly, the symptoms of Hemiscorpius Peters, 1861 envenomations are different from the traditional envenomations by buthids. E. g. a sting by the latter will immediately cause pain, while the sting of a Hemiscorpius is usually painless and the patient risk not knowing that a sting has occurred until more serious symptoms occur. Rouhullah Dehghani and co-workers have now published an interesting review on the scorpionism by Hemiscorpius scorpions in Iran summing up the knowledge on envenomations from these potential dangerous species. 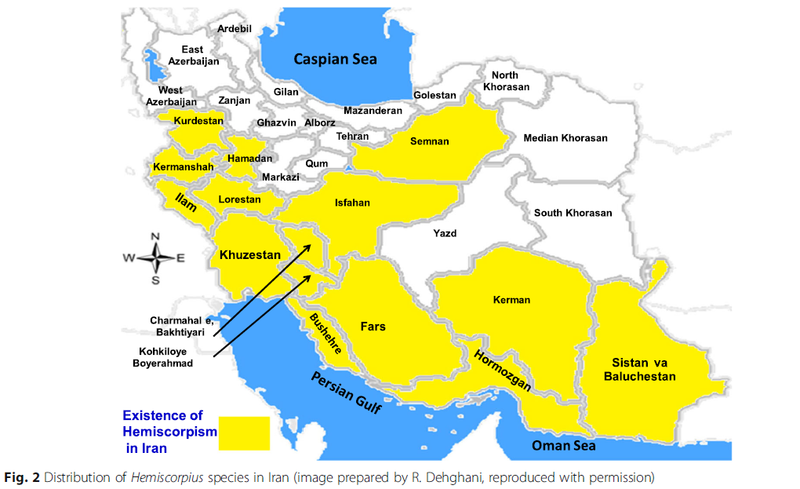 Scorpions are distributed throughout Iran and the genus Hemiscorpius is particularly important in this region. Hemiscorpius lepturus is the most significant species within the genus in the country. Since scorpionism provoked by Hemiscorpius comprises a medical emergency, the present study is focused on this important issue. In order to perform the present work, a review of the medical and health-related literature was carried out in several databases. The current findings indicate that six species of Hemiscorpius are found in 15 states of Iran, mainly in the south and southwest. Deaths caused by stings were reported only for two species. The morphological characteristics and geographical distribution of H. lepturus in Iran, its venom and the toxic compounds, epidemiologic data and clinical manifestations of envenomation as well as treatment for affected people are herein reviewed and described. H. lepturus venom toxicity differs from other Iranian scorpions regarding duration and severity. 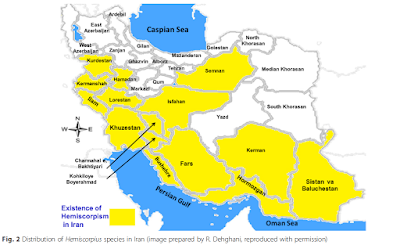 Scorpionism is an important public health problem in Iran, especially in southwest and south regions and in urban areas. It is more prevalent in children and young people. H. lepturus venom is primarily a cytotoxic agent and has hemolytic, nephrotoxic and to some extent hepatotoxic activity. The use of polyvalent antivenom to prevent scorpion sting symptoms is recommended. A well-planned health education program might be useful in preventing scorpionism.